HOUSTON – A no hitter by Texas Southern’s Rebecca Villarreal highlighted two outstanding performances by the Lady Tigers softball team on Friday. The Lady Tigers defeated the University of Houston-Victoria 2-1 and 8-0 in games one and two of a doubleheader respectively. TSU grinded out a one run victory in game one of the series as Fitima Alvizo and Jasmine Hutchinson belted in two runs in the fourth inning. Texas Southern closed the door on any attempted late inning heroics on behalf of UHV late in the contest. 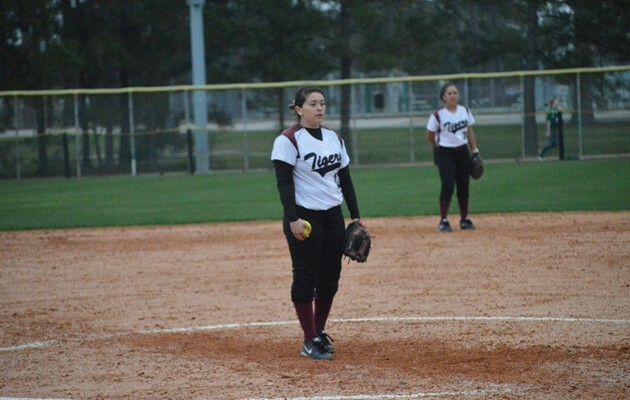 The Lady Tigers got the final out of the game on a groundout to shortstop Princess Daniels. In game two of the series Villarreal nearly notched a perfect game as she pitched five complete shut down innings. In a total of 17 batters faced she allowed no runs while only walking one runner and striking out two. The bats came alive for Texas Southern most notably in the third and fifth innings when the Lady Tigers drove in a total of six runs between the two innings. Thomasina Garza drove in two RBI’s along with Briana Parker. Jasmine Hutchinson batted in a game high three runs in three at bats. Texas Southern will now get set to face Houston Baptist on the road on Wednesday February 27 at 2:00 pm.